When it comes to financial matters, City Councilors Cary Weston and Charlie Longo appear to be applying a technique sometimes used in law enforcement called "good cop/bad cop." 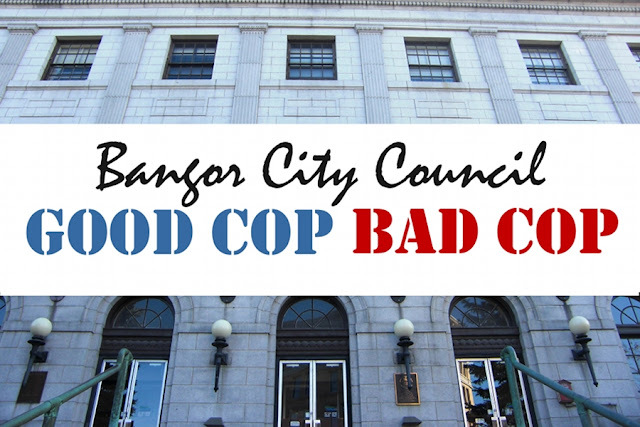 Though Weston and Longo are not members of the finance committee, each took a turn yesterday voting in place of absent committee member Pat Blanchette on the issue of whether or not the city should take possession of the home owned by a Bangor couple delinquent in their loans and property taxes. Team Westin-Longo executed textbook "good cop/bad cop" technique. Westin played the "bad cop," voting with committee members James Gallant and Nelson Durgin in favor of taking possession of the couple's home. Councilman Weston then left the room allowing "good cop" Longo to occupy his vacated seat, who then asked for a re-vote on the matter. Siding with committee members Geoffrey Gratwick and Joe Baldacci against taking possession of the house, the committee then reversed its decision. The Bangor couple will keep their home for now, but they got a strong message that they must repay their loans, or else. City Council will vote on the issue April 9th, yet whatever the outcome, it is nice to see that these two councilors, who are often at odds, have finally teamed up to help the city move forward.